Ever want to just start putting together a whole new look for your house? I've been gathering ideas on Pinterest for some time and I really want to make a cozy home. The trouble is that I don't have a home anymore to make cozy. Oh, sure, I have a place to live, but it's not really mine. I'm not upset by this, but it does make me more mindful of once I get my own space again how I want it to look. I think most people these days start off with hand-me-downs. We did, and they have been wonderful. Some things we got just because they were on sale. Like my dishes. Hubby was kind of hard to please, we had a VERY small budget, and we found two sets of dishes on clearance at Target. They have served us well over the past 11 years, but I am ready to upgrade. I am ready to save up and make a mindful purchase. I am also ready to carefully consider the colors painted in my home and the furniture to fit into it. I think most of the pieces I have I want to keep, and perhaps just paint or refinish. 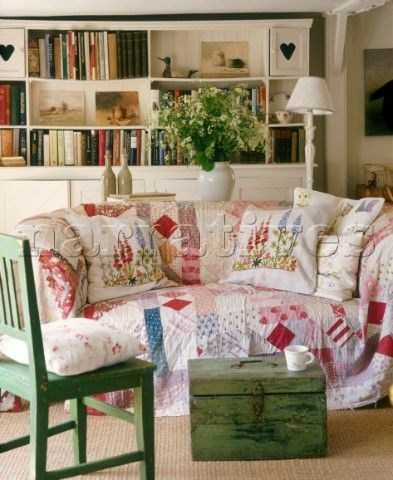 Then there are the textiles - you know, the pillows, the throws, the comfy things to snuggle. These things I have more control over now. I can make them and store them, since that's really what I want to do. I want them to be handmade, not mass produced. I know my children have several blankets that were bought for them, and that's fine. I just want the rest of my house to be handmade with love.